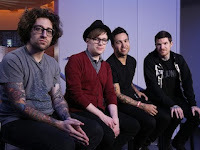 Fall Out Boy earns its third No. 1 album on the Billboard 200 chart, as American Beauty/American Psycho arrives atop the tally. The album moved 218,000 equivalent album units in the week ending Jan. 25, according to Nielsen Music. American Beauty/American Psycho's launch was powered by 192,000 in pure album sales -- the group's second-best sales week ever, and largest since 2007. That year, the quartet's Infinity On High became their first No. 1 when it opened in the penthouse with a career-high 260,000. The new album's first week sales also easily outpaces the start of their last album, Save Rock and Roll, which became their second leader when it launched at No. 1 in 2013 with 154,000. Also notable: Fall Out Boy collects the second-biggest sales week for a rock album in the last two years. Only Coldplay's bow (eight months ago) with Ghost Stories (383,000 in the week ending May 21, 2014) was larger. American Beauty/American Psycho is Island Records' first No. 1 album since Save Rock and Roll.